Every winter, people across the region pull out their shovels and stock up on salt. Clearing walkways, stairs, and driveways is something that comes with the winter territory in order to keep everyone safe. However, there are a number of people who simply can't remove snow and ice on their own. For them, just getting from their front door to the sidewalk during the snow- and ice-filled winter months is dangerous and sometimes impossible. That's where Snow Angels comes in. Started by the City of Pittsburgh in 2011, Snow Angels connects volunteers with elderly people and those with disabilities to assist with snow removal. In 2013, the program was adopted by the United Way's Open Your Heart to a Senior program and also worked in partnership with Family Services of Western Pennsylvania and North Hills Community Outreach. Last year, Snow Angels received 392 requests from residents who needed snow removal services. They were able to fulfill 192 of those requests. This year they're looking to help an even greater number of people, but they need volunteers to make that happen. We want to help them reach that goal. Helping is simple. Anyone living in Allegheny County is eligible to become a Snow Angel, and it's a great volunteer activity for families and high school students (those under the age of 18 must register with an adult). Volunteers are asked to help at least one resident for the full winter season and are provided shovels and salt upon request. Volunteers undergo a short, online training and are then expected to check in with their care receiver and shovel anytime there is a ½ inch or more of snow. 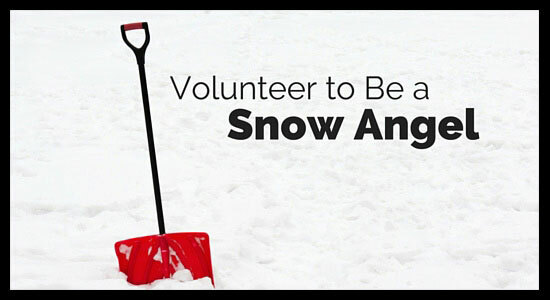 To volunteer as a Snow Angel, CLICK HERE. If you are part of an organization or group that would like to volunteer, please contact Jamison Combs, Program Support Coordinator, at 412-863-5939. You can check out the Snow Angels website for more information on the volunteering process. If you are interested in receiving shoveling services from Snow Angels, you can enroll starting October 5 by calling 412-863-5939 or by emailing manager@alleghenysnowangels.org. Property owners (and some renters) have a responsibility to keep their property safe and free of snow and ice. In Pittsburgh, snow must be cleared within 24 hours, but not everyone is physically capable of making sure that happens. If you've ever thought about volunteering, Snow Angels is a great opportunity to help our neighbors in need and help keep everyone safe. If you want more information on the laws of snow and ice removal, feel free to check out our website. And, if you've been hurt in a slip and fall accident, we're here to help. Get in touch with us 24/7 for a free legal consultation.